When you want to track down an old or obscure bottle of wine, and there aren't any feasible retailer options listed on wine-searcher.com, the next place to turn is the online auction market. Although there are a number of wine auction sites, my gut instinct tells me that Vinfolio is the leader in this space. 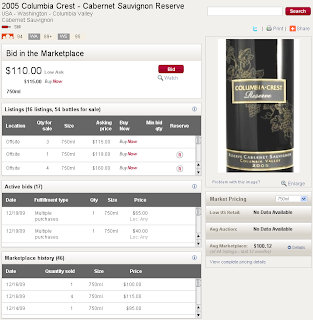 This is based on how polished and functional their website is, how complete their information is in terms of how the process works, and their integration with CellarTracker (which allows users to easily list wines they have on hand for auction without having to let them out of their hands for an indeterminate price). If I wanted to pursue buying the wine from one of these 3 retailers, I would need to spend some time determining whether each of them actually had it in stock, what their shipping terms are, and finally whether I trust that they're legitimate retailers that would follow through with the transaction in a pleasant manner. That can be a little cumbersome, and that's where Vinfolio comes in. They offer a certain level of consistency in the buying experience. When I looked a couple months ago, this wine was available on Vinfolio at a "Buy Now" price of $99.95. I thought that was a nice round number to work with in terms of assessing transaction/shipping costs relative to the wine being purchased. A couple of observations here. First, this wine was selling for less than $25 in stores when it was released. Now that Wine Spectator has rated it 95 points and named it their Wine of the Year it's going for north of $100. This tells me that for as much as we like to think that professional ratings are losing influence and community rating sites like CellarTracker and Corkd are gaining power, Wine Spectator can still move the wine market. Second, we discussed this wine and where to buy it in the Boston area over a year ago. Think of the profit you could have realized if only you'd stocked up! Subscribe to the WWP now and you might know about next year's big values before prices go up. Back to our original hero- the Cakebread. On October 24th, I registered with Vinfolio, secured an account, and bid the asking price of $99.95. I was quickly alerted via E-mail that my bid was accepted automatically (since it was a Buy Now price). Depending on the wine you're bidding on, it might already be in storage at Vinfolio -or- it could be in someone's private collection anywhere in the country. For the particular wine I bid on, I could tell it was in a private collection so I fully expected it would take some time for the wine to travel to Vinfolio so it could in turn be shipped to me. They offer Vinfolio Safe Shipping- a unique program where they monitor the weather at your shipping destination and determine the optimal time and shipping method which will get your wine to you without risk of weather-related damage. They're not just winging it- they've done more to analyze this than anyone I'm aware of. Read their blog entry on the subject for more information. They offer free storage up to six months. This provides the opportunity to wait until weather conditions are favorable -and- you can stack purchases from multiple sellers and then ship a case of wine to reduce per-bottle shipping costs. They've negotiated favorable shipping rates through the carriers they work with, and they don't charge additional fees for packaging materials. For my friends in Massachusetts- they do not ship here. You may be able to finagle something through one of their third-party carriers and assume the risk of this transaction yourself. I wouldn't recommend this approach. It will cost a lot more money and it's probably illegal. Better to ship to a friend/family member in a neighboring state. And better yet, consume it in the neighboring state if possible to avoid the uber-ambiguous dilemma of whether you need to remit taxes to the state for out-of-state purchases just like you should when you buy a computer in tax-free New Hampshire and drive it home to avoid taxes. You do submit taxes to the state at the end of the year for purchases like these, right? And when you buying something on Amazon.com that isn't taxed too, right? Here's more information in this 4-page document from the Massachusetts Department of Revenue regarding "Use Tax". Another tax implication that's ambiguous to me is whether these auction-based sales brokered by Vinfolio (not sure if broker is the right word but you get the idea) are subject to taxation. I've read through Vinfolio's tax collection policies but I'm still at a loss as to whether taxes should be collected (or later remitted by the purchaser) according to the state wine is shipped to. We don't pay tax when we sell a piece of used furniture on Craigslist- do things change when we buy and sell wine? Does the answer change because there is an intermediary involved? Who knows, really. For as much information as Vinfolio offers, many answers depend on the laws in each state and whether you want to play strictly by the book. At any rate, once the bid is accepted the wait begins until the seller ships the wines to Vinfolio for inspection and shipping. I received notification that my wine arrived in San Francisco on November 12th, 19 days after I placed my order. I thought that was pretty reasonable. Once the wine arrives, it becomes part of your VinCellar- Vinfolio's cellar management solution. You request your wine be shipped from VinCellar. I was initially confused by this part of the transaction because an important part of the web page wasn't being rendered using the Google Chrome web browser. When I checked the same page with FireFox, it became immediately clear how to interact with my newly-added wine to request shipping. This appears to have been repaired since I ordered my wine. A nice feature, and one I wasn't aware of when ordering, is the ability to estimate shipping costs and assess whether they can ship to your zip code via the form pictured at left. Enter a Massachusetts zip code and it will say "NA" (can't ship here). 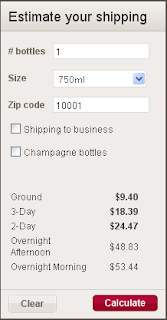 Ship to a Manhattan address and it will estimate the cost of shipping 1 bottle. Switch the quantity to a case and you can trade-off the per-bottle savings vs. how likely you are to do additional purchases in the near future. I really appreciate this feature because one of the single most annoying things in e-commerce is time wasted considering a purchase that you can't even make because they don't ship to your state -or- you find out after investing a lot of time in the transaction that shipping costs are higher than reasonable. I think Vinfolio's cross-country ground cost of $9.40 for a single bottle (as of this writing) is reasonable, especially considering they don't charge additionally for packing materials. You can get it down to $7.27 if you ship to a business. For a case, it's $35.37 to a residence bringing the per-bottle cost to $2.94. These guidelines are helpful when seeking to trade-off shipping costs vs. the cost of the wine vs. procuring locally. I probably wouldn't consider shopping Vinfolio for wines under $30/$40 as the cost of shipping would be prohibitive but your situation may vary. I considered trying the weather-safe option, but that forced a selection of 2nd day air and boosted the cost considerably. Since temperatures were moderate across the country I chose ground. There's no additional fees on top of the price of the wine and the shipping cost. My credit card was charged for the wine when the order was accepted. It was charged again for shipping when I requested the wine be shipped. For Vinfolio it could be Ordered/In Transit to Vinfolio/Arrived at Vinfolio/In Transit to Me. But I couldn't get that information. One potential complication is that if I had the tracking number I could see where the wine came from and Vinfolio avoids letting you know who the seller is. I'm fine with this, but I just want to know the wine is scheduled to arrive at Vinfolio so I can in turn know when I can ask it be shipped to me. I decided to just wait and see if it showed up. And it did. I'm sure I could have called or E-mailed about the tracking number but I decided to not sweat it and see how things went. If I was having to negotiate work schedules or staying at home to receive shipment this could have been a source of tension. In the end, I received a bottle of wine that I couldn't find anywhere in my state, it cost half as much as the nearest retailer was offering it (in Rhode Island), and the seller presumably was able to receive far more than they would have otherwise. Vinfolio brought together a willing buyer and seller in an efficient transaction in an otherwise complex market. They've put in a tremendous amount of work to establish an online auction marketplace that operates within the context of an incredibly varied and complicated set of state laws related to wine shipment. The information they provide in terms of various selling and buying scenarios is the most comprehensive I've seen. Thoughtful touches like weather-safe shipping options, free temporary storage to enable bulk shipments, and reasonable shipping costs make transactions as efficient and effective as is reasonably possible. If you live near San Francisco or Napa, where drop-off and pick-up at Vinfolio would eliminate shipping costs, I can see this method of shopping being amazingly affordable and convenient. A key portion of a page wasn't rendered when using the Google Chrome browser. This has since been fixed. Order tracking could be improved in terms of website navigation and overall clarity in terms of where in the process each order is. 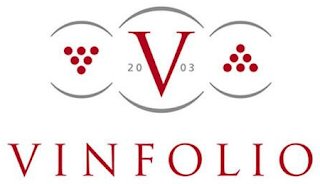 For hard to find wines, especially over $30, Vinfolio is a site I'd recommend consulting. Conveniently, their listings are reflected on wine-searcher.com making it easy to one-stop/comparison shop online. They've put together a marketplace that makes it as efficient and easy as possible to buy and sell wine within the context of a complicated interstate shipping environment. What do you think of online auction sites like Vinfolio? Best thing ever? Or more trouble than it's worth?